Today’s guest post is by Toni , also known as The Happy Housewife. Toni is a military wife and homeschooling mom of seven. If you have never visited her site you should. She talks about a wide range of subjects including tips about how she saves money and tries to eat healthy on a limited budget. Thanks Toni for the great recipe idea. laden kind you can find at the store. 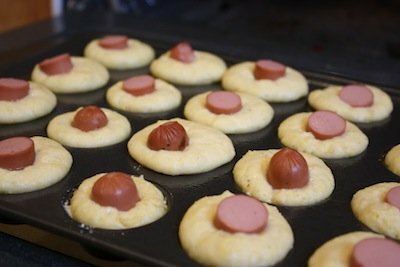 Inspired by Laura’s post I decided to attempt mini corn dog muffins. Take hotdogs and cut into 1 inch pieces. Stick into the muffin mixture. Bake at 400 degrees for about 10 minutes, or until the cornbread is a nice golden color. They make the perfect dipping size for kids as well as a great appetizer. How fun, I saw these on laura’s post and have been wanting to make them, I know they would be a hit at our house. I bought hot dogs today. Can’t wait to try these. I going to send a batch to work with my sister. They have been complaining that you can’t find good corn dogs. Thanks for sharing. Hmmm…been planning on making these but just saw it’s supposed to a MINI muffin tin which I don’t have. *sigh* Wonder if this could be adapted to regular sized muffin tins…hmmmm. @Beth/Mom2TwoVikings, I think you could easily adapt this to a reg. muffin tin. Just adjust the cooking time. Also you may have to add several pieces of hot dog to each muffin or cut them bigger. Just adjust it and it will work out. I just tried this recipe using a regular-sized muffin tin. I had to bake a few extra minutes but they turned out great! My husband and kids have already eaten the entire pan! Next time I might try adding cream corn to add extra flavor, moisture, and nutrients. Thanks for posting this recipe. It’s definitely a keeper for this household! 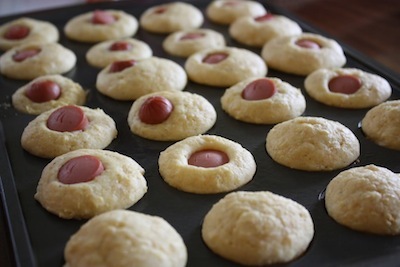 .-= Daphne´s last blog ..Corny Dog Muffins =-. This looks like a great recipe! Do you think these would possibly freeze well? Thanks!